In the past week I received not just one, but two Sunshine Awards. I’m feelin’ the love. And even though I got a bit too much sun while in Southern California on vacation, this sunshine award comes with no harmful rays so I am happy to pass it on. And I met Cindy, the Vegetarian Mamma, at the Nourished Conference earlier this year. I feel so lucky that I get to meet so many terrific people at these conferences! Thank you both for this honor! 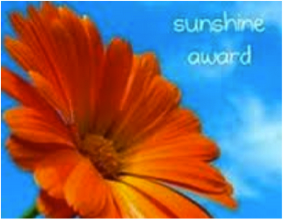 The Sunshine Award is given by bloggers to other bloggers who positively and creatively inspire others in the blogosphere, the interconnected community of website authors. 1. Recipients thank the person who gave them the award and link back to them. Favorite Color: This one is a lay up. Purple. Favorite Animal: Hmmm… I’m not really an animal person. Do teddy bears count? Favorite Number: My basketball jerseys (when I played many years ago) were always 12 and 33, but I would have picked 9 if I could. Favorite Drink: Red wine. Iced tea. Either with chocolate is even better. Facebook or Twitter: A couple of months ago I would have said twitter. Since I’ve created a facebook page I find I like them both! Good Movie or Good Book: Too hard to choose. I like both. What’s important is the “good” part. A great story is a great story, regardless of the medium. My passion: I tend to get obsessed about new things. Right now it’s photography – especially food photography. Next month it may be something else. Giving or Getting presents: Either one. Presents are best when they are a surprise. Favorite Day of the Year: The first day I can open the doors wide and let the spring air cool the house. Favorite Flower: Daisies. I like their simplicity. 3. Recipients select 10 of their favorite bloggers, link to those blogs, then let them know they have been awarded the Sunshine Award! Since I just recently picked some of my favorite food allergy bloggers for the Liebster Award, I am intentionally pick some different bloggers. And I am following Mimi’s lead and selecting only five. All of these are blogs that make me smile. One Woman’s Eye: Written by author and coach Joanne Tombrakos, this blog is the place to turn for a healthy dose of positive reality. And is you need to get more work done, check out her latest book, It Takes an Egg Timer. Baby Bummers: A cartoon blog written by my friend Devon Wickens, this blog is sure to make you smile (especially if you are over (ahem) 40). Middle Passages: Written by Liza Carens Salerno, this blog often has pictures of the East Coast Shoreline, sure to make you smile. Under the Tiki Hut: My favorite posts on this blog are the Friday Top Ten that Carol Kilgore shares. Be sure to check out her new book, In Name Only. Inspiration for Creativity: Andree Santini (who happens to be my sister) writes, creates, and often draws or paints for us. If you’ve got writer’s block, this is a great place to visit. Congrats to all of you and please pass the award on! My spouse and I absolutely love your blog and find many of your post's to be just what I'm looking for. Would you offer guest writers to write content for you? I wouldn't mind creating a post or elaborating on some of the subjects you write concerning here. Again, awesome web log!